@dylans I’d hardly call it a kick, though. Why didn’t the gal leave? I’d like to hear the sound. I have no place for that, but I’d like to hear the tape. @Crimsonorblue22 Really there is no excuse. I’ve tried to rationalize it. You are right no place for it. He’s freaking huge, but even if he wasn’t, that doesn’t fly in my book. It’s not a Bragg situation. While I don’t agree with Hunts action or the young lady in the video that is just as guilty as he is. I would like for someone to explain to me why Tyrek Hill is on the Chiefs roster, Hill pleaded guilty to beating and strangling his pregnant GF. I also don’t believe Hunt acted as he should (don’t think using racial slurs is ok but its no excuse) but both appeared to escalate the situation and I’m not sure I’d even call that an assault but if he lied to the chiefs about it, it’s on him. There ain’t many professions where you can lie to your employer and get away with once found out. I guess the NFL doesn’t care if there isn’t a video of the offense, I’d bet a hefty amount if Hill was recorded in his assault it would look much much worse. Why isn’t the guy from SF suspended for his second offense of the same kind? 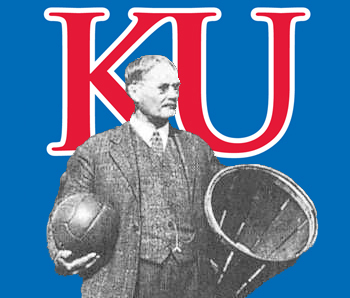 @kjayhawks He is while the investigation is ongoing. The guys from SFs (Rueben Foster I believe) girlfriend is a serial liar as well. Twice she’s either recanted her story or been caught in a lie about domestic abuse. But he’s been put on the commissioners exempt list same as Hunt. Ruben was cut and the Washington racial slurs picked up his rights should he be proven innocent. Chiefs Super Bowl hopes took a major hit. Damn my morals for thinking this is ok! I’m hoping doing the right thing will have good karmic returns. (Berry at 110% would be nice😉 ) It is what it is though; Hunt’s trash and has been dealt with appropriately. This will be a test of the NFL. Ray Rice had almost nothing left in the tank after his incident. Oh and good riddance from KC. Apparently this is not the only incident as Hunt was accused of punching someone else in the face earlier this year. After the Rice incident there is a different environment now with a lot less tolerance than before. Players need to be smarter and not place themselves in this type of situation and walk away when necessary, Hunt failed on all accounts and if he is lucky he might be suspended for the rest of the season and there is a chance his career could well be over. BTW, it’s pretty handy the Chiefs have Ware. Most teams don’t have that luxury. @KUSTEVE You are right the Chiefs aren’t left with a bare cupboard Ware is a good HB/ great backup. He is a load to handle and can catch the ball out of the backfield nicely. Unfortunately he lacks big play ability, but he does look fully healed up now. Rumors are flying around that Jamaal Charles maybe signed. Kareem Hunt’s aggressive behavior was evident on the field several times this season and unfortunately carried over off the field. I see why the Cleveland PD didn’t file charges. Both Kareem and the woman were aggressors. The woman walked back into the conflict three times and twice looks like she swung at someone, including the last time when she and an intervenor were knocked to the ground. Both parties have a social and legal responsibility to walk away from the conflict. I say no to Jamaal Charles, but hope Ware steps up and carries the rushing load. @kjayhawks Apparently, Hunt lied to the Chiefs about what happened in Feb. That, as much as the assault, is why he was released. Plus this is the 2nd time for him. Hill’s assault happened in college and he paid a price for it. 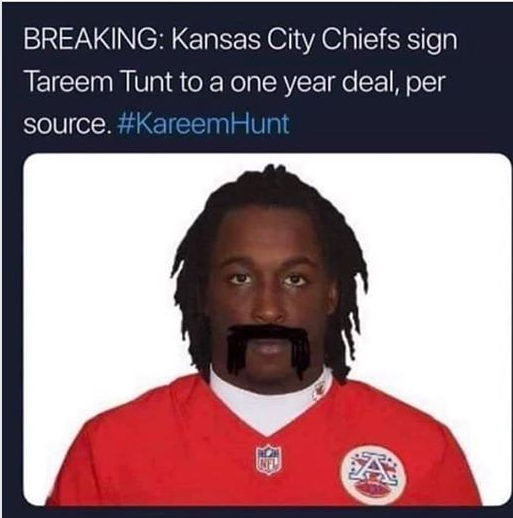 The Chiefs gave him a 2nd chance. I believe that Hunt will get a 2nd chance somewhere at some point down the line. @Hawk8086 I still find it chicken sh** , ether you stand up and hold folks to high standards or you sit down. Shouldn’t be a gray area IMO. I’d say yes to Charles as I really want a backup to ware with some talent to finish out the season. Not sure those rumors have a leg to stand on however. 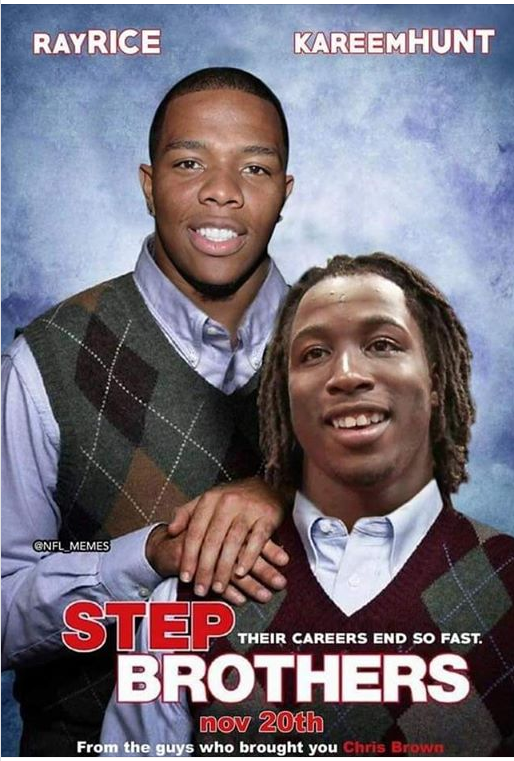 I have a premonition that Kareem Hunt will be signed by the Oakland Raiders in the off season. He’s way to good to be out of football long. He’s only 23 and should have several more years of great runs still to come. I just don’t look forward to the Chiefs playing against him and the story of his release being repeated and repeated. 3 fights in less than a year?!? A big difference between Hill’s and Hunt’s situation is video. Video exist for one and not the other. I think that plays a big part here. In 5 months. That we know about. I am sure there are plenty more as this seems to be a pattern for him.